This week’s photo is a 3D image of a pin mixer. Pin mixers are industrial mixers that can be used in mixing, agglomeration, and conditioning applications. They are particularly adept at processing fine materials such as powders, and are commonly used to process materials such as flue dust, fly ash, limestone, and coal dust, among others. Here’s how they work: the pins are attached to a rotor shaft, and the shaft is housed inside a stationary, cylindrical shell. 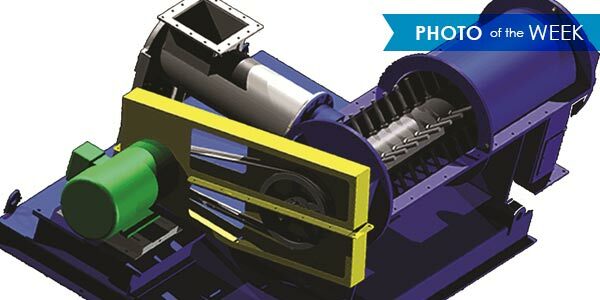 A motor spins the rotor shaft at high speeds, eliminating air and reducing water volume between material particles. The centrifugal force created within the mixer creates “micro-pellets.” These agglomerates can then either be dried and used as an end product, or further processed on a disc pelletizer. In comparison to other agglomeration equipment, the benefits of a pin mixer include more densification with less binder, resulting in reduced binder costs, as well as increased production when used as part of a disc pelletizing system, since densification can be carried out faster in the pin mixer than on the disc pelletizer. Pin mixers also work well as a pre-conditioner before processing on a disc pelletizer, providing the pelletizer with a seed pellet that is optimally prepared for pelletizing. Pin mixers are an ideal solution for many applications, from de-dusting powders, to pre-conditioning material for processing on a disc pelletizer. FEECO offers high-quality, custom pin mixers to suit your exact processing needs. For more information on pin mixers, contact us today!